Francis was born in 1182, the son of a wealthy cloth merchant. His early years were frivolous, but an experience of sickness and another of military service were instrumental in leading him to reflect on the purpose of life. One day, in the Church of San Damiano, he seemed to hear Christ saying to him, "Francis, repair my falling house." He took the words literally, and sold a bale of silk from his father's warehouse to pay for repairs to the church of San Damiano. His father was outraged, and there was a public confrontation at which his father disinherited and disowned him, and he in turn renounced his father's wealth—one account says that he not only handed his father his purse, but also took off his expensive clothes, laid them at his father's feet, and walked away naked. He declared himself "wedded to Lady Poverty", renounced all material possessions, and devoted himself to serving the poor. After three years, in 1210, the Pope authorized the forming of the Order of Friars Minor, commonly called the Franciscans. ("Friar" means "brother," as in "fraternity", and "minor" means "lesser" or "younger." I take the meaning to be that a Franciscan, meeting another Christian, is to think, "I am your brother in Christ, and your younger brother at that, bound to defer to you and to give you precedence over myself." Preach as you go, saying, "The kingdom of Heaven is at hand." ... You have received the Gospel without payment, give it to others as freely. Take no gold, or silver, or copper in your belts, no bag for your journey, no spare garment, nor sandals, nor staff. They would have no money, and no property, individually or collectively. Their task was to preach, "using words if necessary," but declaring by word and action the love of God in Christ. Francis was partial to a touch of the dramatic (see his parting from his father, for example), and it was probably he who set up the first Christmas manger scene, to bring home the Good News of God made man for our salvation, home to men's hearts and imaginations as well as to their intellects. In 1219, Francis went to the Holy Land to preach to the muslims. He was given a pass through the enemy lines, and spoke to the Sultan, Melek-al-Kamil. Francis proclaimed the Gospel to the Sultan, who replied that he had his own beliefs, and that muslims were as firmly convinced of the truth of Islam as Francis was of the truth of Christianity. Francis proposed that a fire be built, and that he and a muslim volunteer would walk side by side into the fire to show whose faith was stronger. The Sultan said he was not sure that a muslim volunteer could be found. Francis then offered to walk into the fire alone. The Sultan who was deeply impressed but remained unconverted. Francis proposed an armistice between the two warring sides, and drew up terms for one; the Sultan agreed, but, to Francis's deep disappointment, the Christian leaders would not. Francis returned to Italy, but a permanent result was that the Franciscans were given custody of the Christian shrines	then in muslim hands. Back in Italy and neighboring countries, the Order was suffering from its own success. Then, as now, many persons were deeply attracted by Francis and his air of joy, abandonment, and freedom. What is overlooked is that these were made possible only by his willingness to accept total poverty, not picturesque poverty but real dirt, rags, cold, and hunger, and lepers with real pus oozing from their sores and a real danger of infection. Many idealistic young men were joining the Order in a burst of enthusiasm and then finding themselves not so sure that such extremes of poverty were really necessary. When there were only a few friars, they were all known to Francis personally, and the force of his personality kept the original ideals of the Order alive in them. Now that the Order was larger, this was no longer enough. In 1220 Francis resigned as minister-general of the Order, and in 1221 he agreed to a new and modified rule, which he did not approve, but could not resist. He died on 4 October 1226. The Franciscan split into the Conventual Franciscans, who held a limited amount of property in common, and the Spiritual Franciscans, who disavowed all property. They taught that Christ and the twelve apostles had held no property, singly or jointly. This view offended those who held property, and was declared to be heretical (proof text, John 18:10; Jesus said to Peter, "Put up thy sword...."). In 1318, several Spiritual Franciscans were burned at the stake in Marseilles. A story is told of the days when the friars first began to have permanent houses. A beggar came by when Brother Juniper was at the gate and asked for a little money. Brother Juniper said, "There is no money in the house. But wait a minute. Last week someone gave us an altar cloth with little silver bells attached. We don't need those. I will cut them off for you. They will be as good as money." And he did. When the sacristan learned what had happened, he complained to the prior, who said, "We are fortunate that he did not give away the cloth itself. But send him to me, and I will scold him." Brother Juniper came, and the prior scolded him until he was hoarse. Brother Juniper noticed that the prior was hoarse, and went to the kitchen and cooked him some mint sauce. He brought it to the prior, who had gone to bed. He said, "Father Prior, get up and eat this mint sauce. It will be good for your throat." The prior said, "I don't want any mint sauce. Go away and let me sleep." Brother Juniper said, "It's good sauce, and will be good for your throat." The prior said, "Go away, I don't want it." Brother Juniper said, "Well, if you won't eat it, how about holding the candle while I eat it?" This was too much for the prior. He got up and they both ate. "O how happy and blessed are those who love the Lord and do as the Lord himself said in the gospel: You shall love the Lord your God with your whole heart and your whole soul, and your neighbor as yourself. Thereofore, let us love God and adore him with pure heart and mind. This is his particular desire when he says: True worshipers adore the Father in spirit and truth. For all who adore him must do so in the spirit of truth. Let us also direct to him our praises and prayers, saying: "Our Father, who are in heaven," since we must always pray and never grow slack. Furthermore, let us produce worthy fruits of penance. Let us also love our neightbors as ourselves. Let us have charity and humility. Let us give alms because these cleanse our souls from the stains of sin. Men lose all the material things they leave behind in this world, but they carry with them the reward of their charity and the alms they give. For these they will recieve from the Lord the reward and recompense they deserve. We must not be wise and prudent according to the flesh. Rather we must be sinple, humble and pure. We should never desire to be over others. Instead, we ought to be servants who are submissive toe very human being for God's sake. The Spirit of the Lord will rest on all who live in this way and persevere in it to the end. He will permanently dwell in them. They will be the Father's children who do his work. They are the spouses, brothers and mothers of our Lord Jesus Christ. 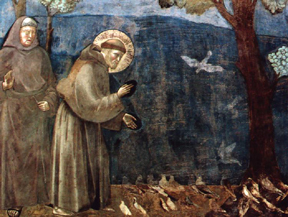 Many readers are enthusiastic about Saint Francis of Assisi, a biography of Francis by G. K. Chesterton. A reader of these essays has also recommended Saint Francis of Assisi, a Biography by Omer Englebert.